They are used extensively to minimise radio frequency emissions generated by enclosed electronic equipment and to protect electronic equipment from electromagnetic interference arising from external sources. Optolite™ shielded windows have a highly conductive micro-fine wire mesh which attenuates EMI/RFI emmisions. Different meshes to suit varying applications are available. The shield effectiveness, measured by using the “Hole-in-the-Wall” technique, is typically between 60dB and 70dB from 100KHz to 1GHz and 35dB up to 10GHz for blackened stainless steel meshes. Optolite™ shielded windows are supplied fabricated to customer requirements. Overall standard thicknesses are 2.5, 3, 4, 6mm. Other, non-standard thicknesses, from 1mm upwards, are also available to order together with an optional non glare finish. 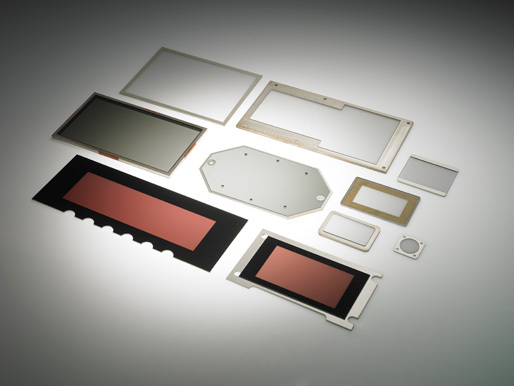 For larger displays, weight can be an extremely important consideration in the design of shielded filters. Optolite™ Clear HSR and Optolite™ coloured acrylic filters weigh only half as much as glass. Additionally, an acrylic filter is up to five times as resistant to breakage as a comparable glass filter. Keyflex will be pleased to advise on the design and construction of Optolite™ shielded windows for specific applications.